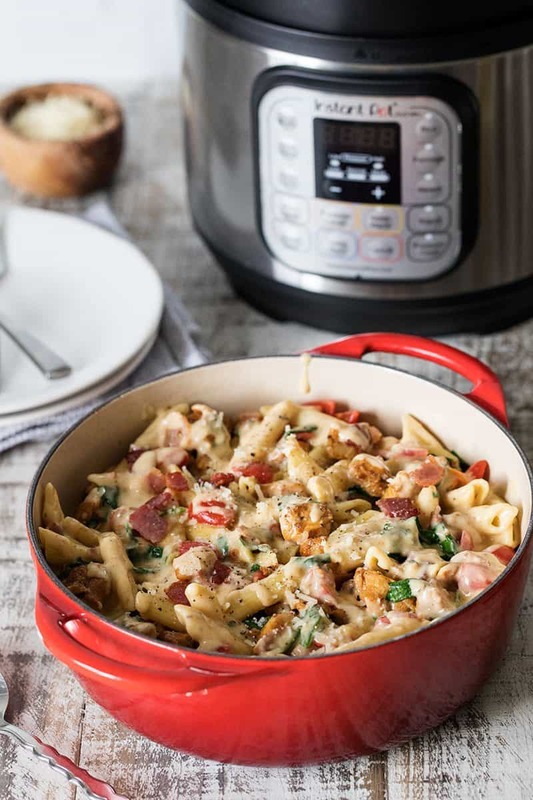 This Pressure Cooker Chicken Bacon Penne Pasta is a quick, easy, one-pot meal that’s rich, creamy, and delicious! It’s pure comfort food that’s ready in less than 30 minutes. Your family’s going to love this one! When I saw this Food Network article today I thought of you. I know you regularly convert traditional cooking recipes to pressure cooking recipes. 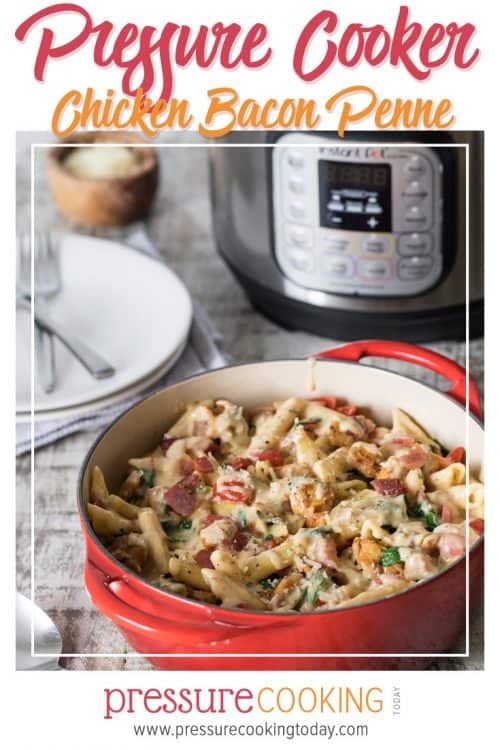 Given that this traditional recipe is the most re-pinned pasta recipe on Pinterest (2.8 million re-pins) and has been shared 50,000 times on Facebook, I suspect it would be a very successful post on your blog if it’s converted to a pressure cooker recipe. Also sounds like a delicious dish! One look at the recipe and I knew Sigrid was right, my readers and my family would love it too. 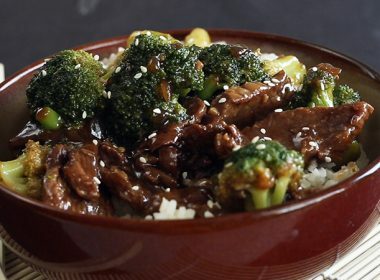 Especially if I transformed it into a quick and easy one pot pressure cooker meal. . 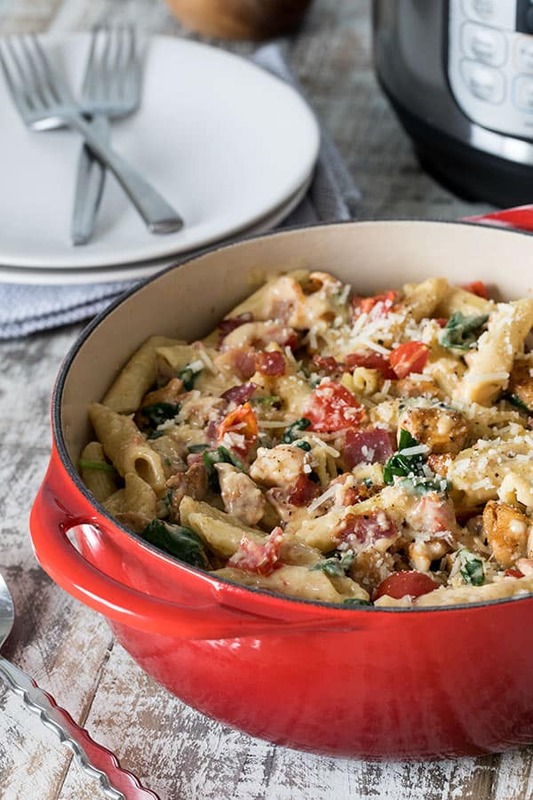 The original recipe, Chicken and Bacon Pasta with Spinach and Tomatoes in Garlic Cream Sauce, is from Julie’s Album where she shares easy-to-make weeknight dinner recipes. In addition to the chicken, bacon and pasta, you add spinach and tomatoes. 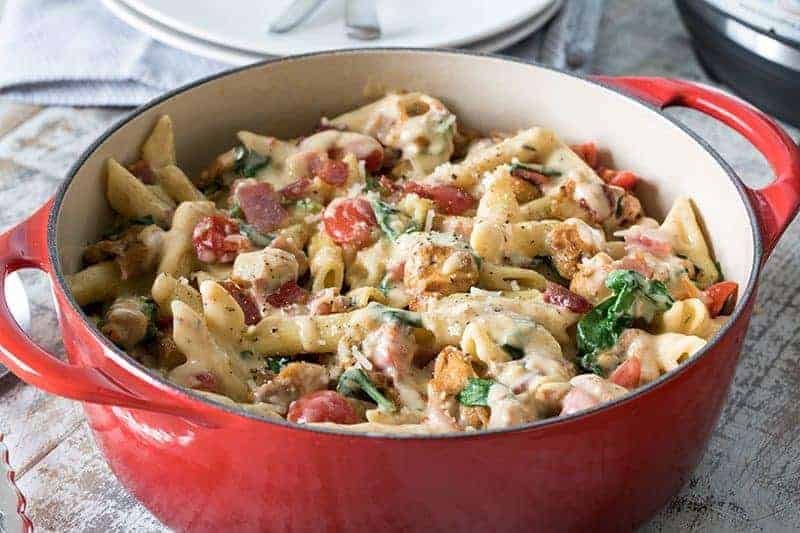 The spinach and tomatoes add a great pop of color and good for you veggies to the pasta, so you can feel good about making it a one pot meal. If you wanted you could easily double the spinach and tomatoes. 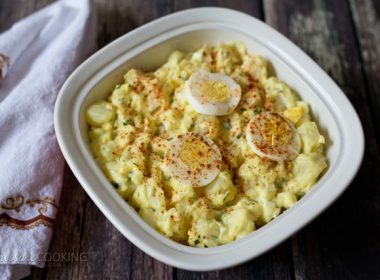 The paprika in the recipe adds a pretty color to the creamy sauce and bumps up the smokiness of the bacon flavor in the dish. The original recipes uses boneless, skinless chicken breasts. I prefer using chicken thighs in recipes when cooking them in the pressure cooker, so I used chicken thighs when I made this pasta. Chicken thighs are more moist and tender when cooked in the pressure cooker. Boneless, skinless chicken thighs are widely available in most stores now. I generally buy a large package of thighs at Costco to keep in the freezer. 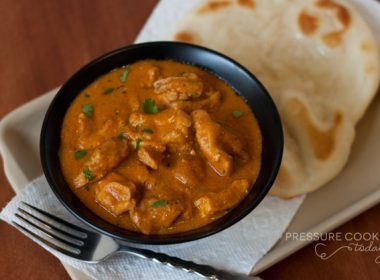 But if you prefer breasts, either breasts or thighs will work well in this recipe. My family absolutely loved this recipe. It’s flavorful and hearty. It reheats well and you can even freeze leftovers. I like to freeze it in individual portions for quick lunches. 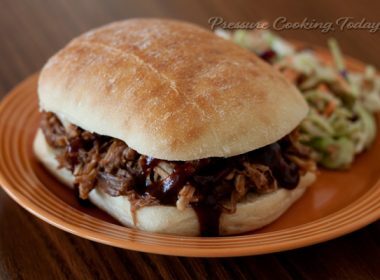 Pin this recipe because you’re definitely going to want to give this pressure cooker recipe a try! Thanks Sigrid for suggesting I give it a try. Update: This recipe has quickly become a reader-favorite and is one of my most-shared recipes this summer. Some readers have emailed me questions about the recipe, so I’ve created a video to show you how easy it comes together. Give it a try and let me know what you think! Add chicken, paprika and Italian seasoning to a Ziploc bag and toss to combine. Set aside. Select Sauté and add the bacon to the pressure cooking pot. Fry for about 5 minutes until crisp, stirring frequently. Transfer the bacon to a plate, leaving the bacon fat in the pot. Add the butter to the pressure cooking pot. Add the garlic and red pepper flakes and sauté for 1 minute. Add the chicken to the pressure cooking pot and sauté for 3 minutes, stirring occasionally. Stir in the chicken broth and deglaze the pot if necessary. Add the pasta and stir to combine. Add enough water to cover the pasta, about 3 cups. Lock the lid in place. Select High Pressure and 3 minutes cook time. When the cook time ends, turn off the pressure cooker. Use a quick pressure release, or if necessary, use an intermittent release to prevent liquid from coming out of the valve. When the valve drops, carefully remove the lid. Stir the mixture and taste penne for doneness. If needed, select Simmer/Sauté and cook for a few minutes more, stirring often, until the pasta is tender. Stir in the half and half and Parmesan a little at a time until cheese melts. Stir in the bacon, spinach, and grape tomatoes. Season with salt and pepper to taste. Is there any cheese substitute, as I don’t have Parmesan on hand? Thanks! Hi Jeanine – not, there’s not really a good substitute for Parmesan in this recipe. I would just omit it and wait for the pasta to absorb the sauce if it needs thickening. Everybody loved it. I only had 3/4c Parmesan on hand, so I added 1/4c Cream Cheese. Also, we don’t like grape tomatoes, but diced regular-size tomato worked just fine. Great! I’m a big believer in changing up a recipe to use what you have/like. Thanks Mike! I don’t have half and half but I have heavy cream. Do I just use less or can I use half milk and half cream? 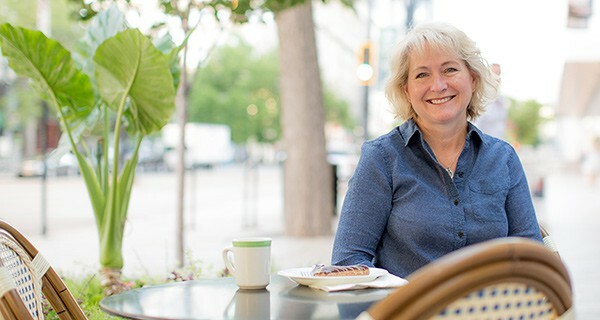 Hi Stephanie – yes, you can use half milk and half cream. Great taste. I didn’t have Penne so I use Orecchiette pasta instead; I did have to add 2 minutes to the cook time after the first 3 minutes. My only problem was there was way to much liquid left at the end of cooking. I just put it on saute and cooked it down a few minutes. I also added my spinach at this point because my husband likes them cooked a little. I wound up using a corn starch slurry to thicken it up. Even my son who hates tomatoes and spinach ate it. Hi Carol – glad it was a big hit and that you thought to thicken it with a cornstarch slurry. Different pastas absorb different amounts of liquid, so I think that was probably the difference. Also, pasta will soak up the liquid as it sits. What is your go-to way to freeze the individual portions? Hi Stephanie – I like to freeze 1 1/2 cup servings in a Quart size freezer bag. my pressure cooker doesn’t have a saute setting – just pressure with a valve. 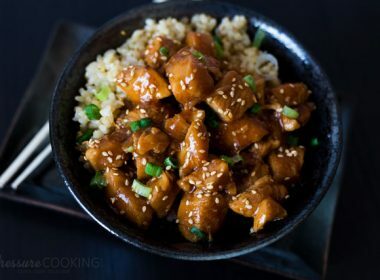 is there a traditional way to cook this recipe? it sounds so good i’d like to make it even on the stovetop if necessary. 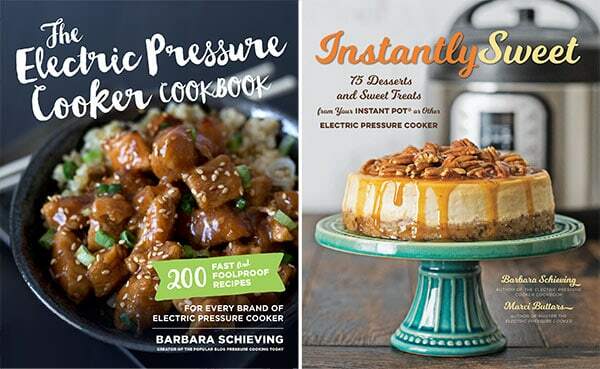 Hi Barbara – on pressure cookers without a saute setting, you just us the pressure setting without the lid. Sounds like a delicious way to change it up – thanks for sharing Jan! This is my new favorite IP meal – it is beyond delicious. My only change was I added one minute to the cook time as I like my pasta “done” and not so firm. It was perfect, leftovers even better. Thanks for another keeper! That’s awesome – thanks Brenda! Sounds delicious but I’m not sure of the advantages of doing this on a pressure cooker vs. a normal pot. Since you have to first bring the pot up to pressure, pasta doesn’t really cook significantly faster in a pressure cooker. Nor does the chicken, after it’s been browned. In fact, since I like the tomatoes and spinach a little bit cooked, it’s easier to do in a normal pot since I can add ingredients at any time (whereas in a pressure cooker, you can’t o anything while it’s under pressure). I haven’t been able to eat wheat pasta for 30 years (systemic wheat allergy). I use Andrean Dream Quinoa pasta. Fusilli. (Corn free, vegan, non-gmo, gluten free organic). Tastes great! (Not like sawdust as so many do.) Cook time is normally 14-16 min. I don’t mind experimenting on time for pasta doneness but I do have two questions. (1). Is three minutes the smallest time to ensure thorough cooking of the chicken quantity/particle size. (2). Any recommendation on time with this pasta? I love your blog. 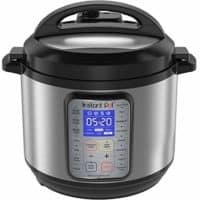 Your site is the reason I bought my 8 qt instant pot. 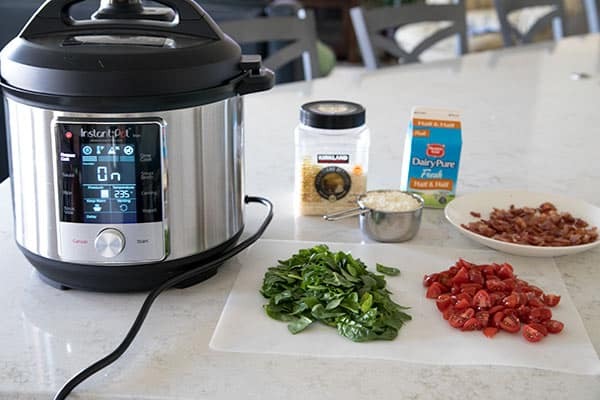 Thanks Renee – so nice to hear you love Pressure Cooking Today and I could inspire you to buy your Instant Pot. A good guide for pasta is 1/3 of the cook time on the package minus one minute. So 14 divide by 3 is 4ish minus 1 minute – so a 3 minute cook time should be good for your quinoa pasta and the chicken. You can use a shorter cook time for the diced chicken if needed, just cut the chicken a bit smaller. Enjoy!